William "Bill" Schroeder: teacher and historian; born 2 December 1933 to Wilhelm Schroeder (3 November 1903-10 August 1906) and Gertruda (Wiebe) Schroeder (4 September 1902-21 July 1999) in Horndean, Manitoba, Canada. He was the third of four children in the family. He became a Christian in his youth and was baptized on 30 June 1948. On 9 October 1958, he married Augusta Voth, daughter of Abraham J. Voth (4 January 1891-1966) and Helena (Wiens) Voth (1894-1944), with whom he had four children. Bill was a teacher and mapmaker known for his publications on Mennonite history and for his volunteer work with various organizations. He died in Winnipeg, Manitoba on 11 December 2013. In his early years, William lived with his parents and three siblings on a farm near Horndean, Manitoba. He attended high school in Winkler, Manitoba, before taking training in Winnipeg to become a teacher. Later, he also completed his Bachelor of Arts and Bachelor of Education degrees at the University of Manitoba. He taught high school in Clover Plains, Manitoba for eight years before moving back to Winnipeg in 1963. Meanwhile, he met Augusta Voth, and the two married in 1958. They had one daughter and three sons, all of whom survived childhood. One of Schroeder’s primary interests was Mennonite history. When the Centre for Mennonite Brethren Studies first opened in Winnipeg in 1969, he helped to organize the material, as well as building shelves, binding books, and assisting in many other ways. He continued to help at the archives for many years afterwards, besides volunteering with the Mennonite Central Committee, the Manitoba Mennonite Historical Society, and the Mennonite Brethren Historical Committee. In addition, he helped at a local thrift store and at an annual music festival just outside Winnipeg. Touring historic sites was one of his interests, and he traveled to the former Soviet Union eight times, including several trips as a tour guide. Schroeder also published several books, including The Bergthal Colony in 1974 (revised edition in 1986) and Kornelius Erdmann Buhr, 1826-1885 (published in 1976). He also published an English translation of The History of the Church in Chortitza: Towards an Understanding of the History of the Church in the Mennonite Colonies in South Russia by Johannes van der Smissen. However, Bill Schroeder is possibly best known for his collaboration with Helmut Huebert on The Mennonite Historical Atlas, published in 1990 and revised in 1996, which made use of his extensive skills as a cartographer. In January 2013, he received the Mennonite Historical Society of Canada's Award of Excellence for his contributions in over thirty years of research. Besides his historical work, William was an active member of the Elmwood Mennonite Brethren Church and was involved in many other pursuits, including gardening and attending musical events. He also enjoyed interacting with his family, which came to include ten grandchildren and six great-grandchildren. His health began to fail in his last years, and he died in Winnipeg on 11 December 2013. 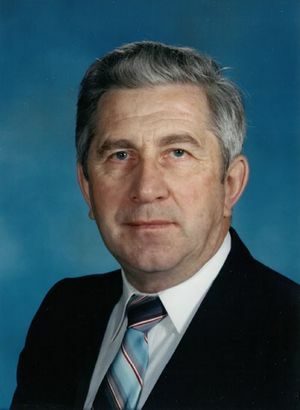 William "Bill" Schroeder was a dedicated teacher and amateur historian, known for his humble attitude to life as well as for the excellence of his research. Through his faith and his commitment to his church, his family, and his work, he provided a good example for others to follow. GRANDMA (The Genealogical Registry and Database of Mennonite Ancestry) Database, 4.19 ed. Fresno, CA: California Mennonite Historical Society, 2005: #222159. Mennonite Historical Society of Canada. "Award of Excellence." Web. 14 March 2017. http://www.mhsc.ca/index.php?content=http://www.mhsc.ca/mhsc/award.html. Obituary. Mennonite Brethren Herald (28 February 2014). Web. 14 March 1948. http://mbherald.com/obituaries/william-schroeder-2/. Obituary. Helena Voth. Die Mennonitische Rundschau 67(2 August 1944): 3. Obituary. Joh. Abraham Voth. Die Mennonitische Rundschau 89 (1 June 1966): 11. Obituary. Winnipeg Free Press. Web. 14 March 2017. http://passages.winnipegfreepress.com/passage-details/id-208646/SCHROEDER_WILLIAM. Schroeder, William. The Bergthal Colony. Winnipeg: CMBC Publications, 1986. Huebert, Susan. "Schroeder, William "Bill" (1933-2013)." Global Anabaptist Mennonite Encyclopedia Online. March 2017. Web. 24 Apr 2019. http://gameo.org/index.php?title=Schroeder,_William_%22Bill%22_(1933-2013)&oldid=147789. Huebert, Susan. (March 2017). Schroeder, William "Bill" (1933-2013). Global Anabaptist Mennonite Encyclopedia Online. Retrieved 24 April 2019, from http://gameo.org/index.php?title=Schroeder,_William_%22Bill%22_(1933-2013)&oldid=147789. This page was last modified on 11 April 2017, at 03:12.